Artists for centuries used light, or the absence of light (as in shade) as their most important material. Artists added value or shading by adding black ink or charcoal to darken the color and white to lighten. 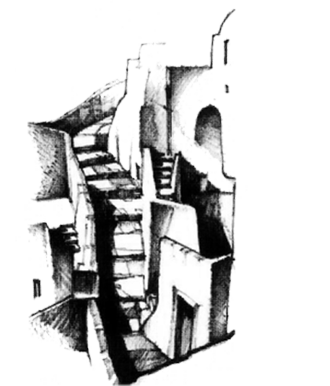 Shading is a wonderful tool because it builds dimension by illustrating volume and mass to provide a three dimensional appearance to drawing and painting. Natural light comes from the sun up in the sky, so many drawings have a light coming from above, rendering objects lighter on top and darker nearer the bottom. Bringing light in from the bottom (try a flashlight under your chin in a dark room!) or from an open window like the work of the Dutch artist Vermeer, gives a dramatic effect. Designers use shade to portray forms realistically. When light and shade are used, the hidden third dimension comes alive on your two dimensional page and you become a sculptor of volume and mass. Bring the hidden shadows out of your drawing. Bring the world onto your page! Activity 1 – Shade With Value! On a piece of paper, draw 10 identical 1” x 1” squares. Take a drawing pencil and mark the squares below 1-10. Square #1 should be white; square #5 should be medium gray; and square #10 should be black. Fill in the other squares with stepped shades of white to medium gray and medium gray to black. Now find a magazine or art picture that is black and white. 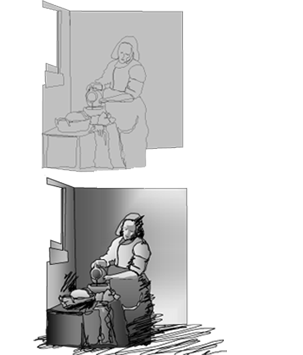 Photo copy the picture then trace and label the values in the picture in terms of their shade, from 1-10. Next, trace or re-draw the picture using the values 1-10 on a third sheet of paper. Paste your grid and your drawings in your journal. Activity 2 – Shade and Create Form: Shade and Create Shadows! Take an egg and a piece of paper. Draw the egg larger than life. 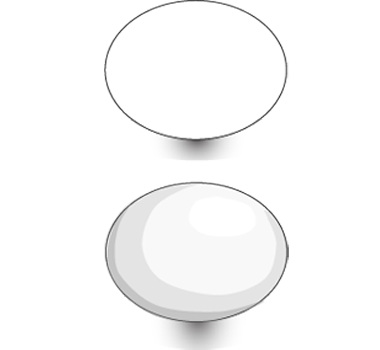 Look at the white of the egg and notice how it changes. Your mission is to deliver those changes, called gradient or shade, to your paper. In the process, your simple line drawing will emerge from the paper life-like and three dimensional! Find the light source that is shining on your egg. Draw a small sun on your paper in the location of the light source to remind you where your light source is. Carefully draw the contours of the different shades or values of the egg starting with the whitest point. Also note that the eggs surface casts a shadow; draw the contours of the shadow as well. Each contoured area has to have a different value. Start with the lighter values and work towards the darker values.Select the number of the value and fill in the value with a shaded tone. Cut out the egg and paste it in your journal. Draw along with this video on value on form. Activity 3 – Shade Takes at Least 3 Values to Reveal Form! Arrange some fruit on a plate. Observe the colors of the fruits on top where the light hits first. Observe the color of the fruits underneath in the shadows. 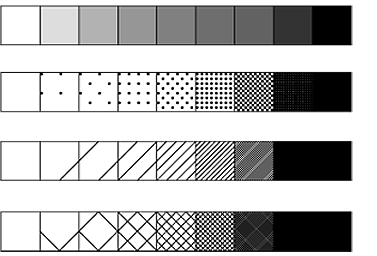 Draw the fruit arrangement in line first, then add black, gray and white values. 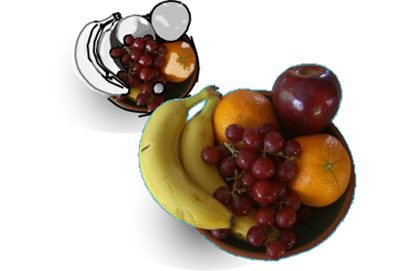 Build the three dimensional form of the fruit on your two dimensional piece of paper. Remember to use at least three values. Breathe life into your still life! Create a still life online! Rearrange or eat the fruit to create a new still life! Activity 4 – Form forms! 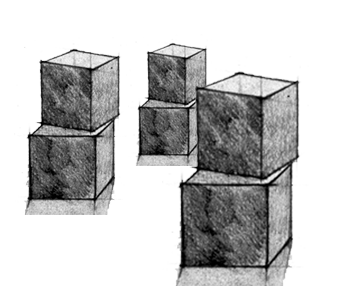 In this activity you will set up architectural forms- cylinders, cubes and pyramids. Make sure that you have a direct light source and see different values on different faces of the form. Next, make a line drawing of the forms on a page. Using your value and range of tones, build the 3 dimensional forms on your 2 dimensional sheet. Stroke refers to the width of your medium when shading. If the stroke is very light and even, it will come across as a tone. If it is strong it will come across with energy! Experiment with different hardnesses of lead and different drawing media. 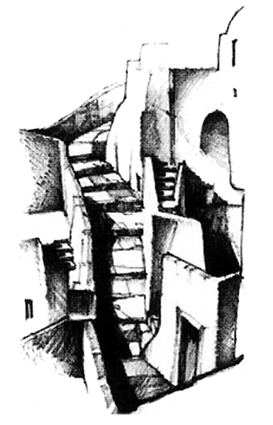 Experiment drawing with different lengths of stroke from your wrist, elbow or even shoulder. Make 3 different drawings that show a range of stroke and value. Stroke adds value but also add expression. What is a major material used by artists and designers? What is gradient in a drawing or painting? Shade can be applied to the same color to build volume. Most drawings should have at least three shades.